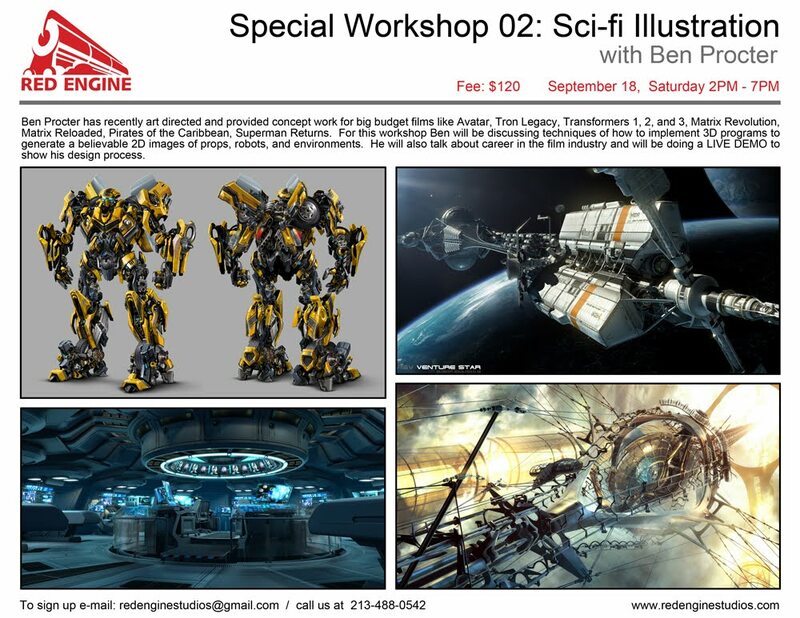 Red Engine Studios will be hosting a special workshop on Saturday September 18th with Ben Procter, industry leading art director and concept designer. His projects include some of the biggest blockbusters films such as Avatar, Transformers 1, 2, and 3, Matrix Revolution, Matrix Reloaded, Pirates of the Carribean, Superman Returns, and Tron Legacy. LIVE DEMO! on how to implement 3D softwares to generate believable 2D images of props, robots, and environments. Illustrator Extraordinaire Justin Sweet will also be giving a workshop at Red Engine Studios on Saturday, December 11th (more info coming soon) Check www.redenginestudios.com for updates.